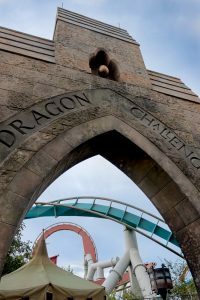 One of the very cool things that I missed on our first trip to Universal Orlando was the queue for the Dragon Challenge. I want to tell you guys about this amazing space in detail for two reasons. First, because I think it is an often overlooked ride and one that any Harry Potter fan would LOVE the experience of walking through. Secondly, this ride is scheduled to close for good on Sept. 4th, 2017. 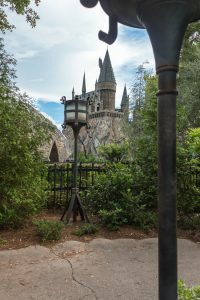 So, if you have the chance, you need to see it now before it’s gone for good (and, well, if you aren’t going to be able to squeeze in a visit to Hogsmeade at Universal’s Islands of Adventure before it closes my description and photos will have to be the next best thing). Dragon Challenge is a roller coaster. More specifically it’s two coasters that are entwined together. The ride first opened in 1999. Yes, it predates the building of the wondrous Wizarding World of Harry Potter that is Hogsmeade. The ride was originally called Duelling Dragons and was once part of the Lost Continent themed area of the park. 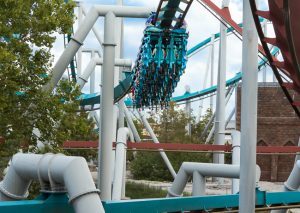 The two coasters used to run simultaneously, setting up for several staged “near misses” as the two dragons raced each other in a twisting turning ride. After several unfortunate accidents involving loose object flying off from one coaster and hitting occupants on the other, the ride was changed to have the two dragons sent out separately. 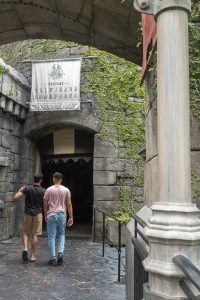 In 2010 the ride was renovated, renamed as “Dragon Challenge”, to coincide with the grand opening of The Wizarding World of Harry Potter. The red Fire dragon became the Chinese Fireball from Rawling’s books, while the blue Ice Dragon became the Hungarian Horntail that Harry had to face down during the first task of the Triwizard Tournament. You get a pretty good view of the ride as you are walking through Hogsmeade, and well, it’s a roller coaster. If you happen to like coasters, great. If, like my family, you’re travelling with a bunch of coaster cowards, you could easily skip over this ride and that would be a huge mistake because the queue is PHENOMENAL. 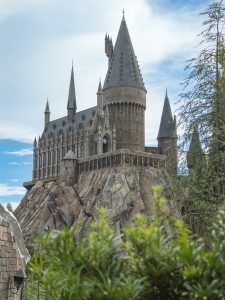 Even in you like roller coasters, you might be more focused on the Harry Potter experiences that are to be found in Hogsmeade. The ever present Hogwarts castle in the background is beckoning, right? Or perhaps you’re more interested in shopping at Honeydukes. Either way, again I say, you are missing out if you skip this ride because the queue is a Harry Potter fan’s dream (and includes not one, but two, key film props, plus a couple other treasures). So What Exactly IS In the Queue? 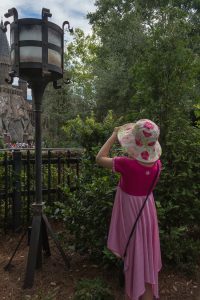 The lead up to the ride is focused on the Triwizard Tournament which takes place in Harry Potter and The Goblet of Fire. First, you walk along a shady forest path, past a number of banners representing the four Triwizard champions, Be sure to look off to your left for a great view of Hogwarts. Continue along and you’ll be treated to a peek at Hagrid’s Hut. Officially the hut is part of the queue for the Flight of the Hippogriff, but you also get a neat view of it, from a different angle, as you’re walking along the Dragon Challenge pathway. 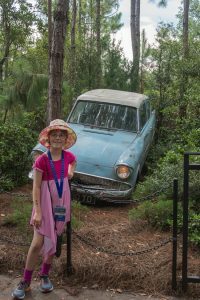 Eventually, you arrive at the infamous Ford Anglia that Harry and Ron crashed into the Forbidden Forest in the second film, Harry Potter and the Chamber of Secrets. 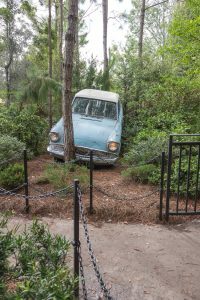 The Weasley’s flying car is roped off, beyond a set of chains, but you walk quite close to it, within two feet or so. It seems to be “alive”, with the horn beeping occasionally and the headlights flickering on and off. According to one of the VIP tour guides that I was speaking with while at Universal, this is the actual car from the film. Just past the flying Ford Anglia is a set of metal detectors. They are dead serious about no one boarding this ride with any loose objects. You even need to empty out your pockets. If you have a camera and you ask to just walk through the queue it is possible that they will tell you that this is as far as you can go. 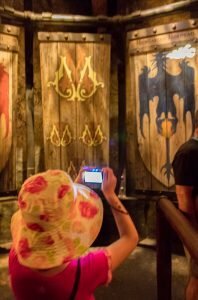 I feel like we really lucked out here, so I want you to be aware that you may, or may not, be able to walk the entire queue with a camera. However, if you leave the tech behind, empty out your pockets, etc, just as if you were going to ride one of the coasters, I can’t see that they would refuse you entrance. Thus, allowing you to walk through and see the queue in its entirety (and chicken out at the end and not board the coaster, if like me, being flipped upside down multiple times is just not your cup of tea). 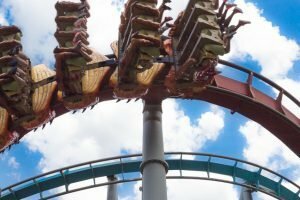 I was quite surprised by two things about the Dragon Challenge queue. First, just how LONG the queue is. We walked along at a pretty steady pace, stopping to take photos here and there, and it took us a little over twenty minutes to make our way through the entire queue (this is without lining up, or waiting for people — simply walking straight through took a surprising amount of time). Secondly, I was surprised to find out how much of the queue was indoors. The bit through the forest, from the front gate to the Ford Anglia, was really just the tip of the iceberg. 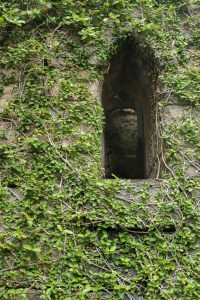 …as you enter a vine-covered tower and find yourself inside the champions’ tent from the First Task of the Triwizard Tournament. The tent is dimly lit, so getting decent photos can be challenging. The tent has refreshments for the champions, as well as a camp bed where the injured can rest. 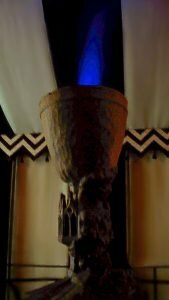 You’re also treated to a view of the goblet of fire, complete with cool fire effect. Our guide pointed out that this bed found in the corner of the Champions tent belonged to Cedric Diggory, based on the Hufflepuff crest found on the trunk sitting nearby. Took this one with flash, so you can see some of the cool detail work on the cup, but the blue flaming effect is a bit ruined. From the tent, you walk into a cavern-like room, where the path winds around a large pedestal. 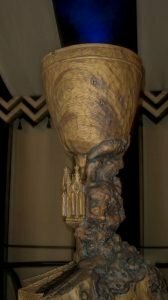 Perched on the pedestal is the Triwizard Cup. It’s gorgeous, all glowing and magical looking. 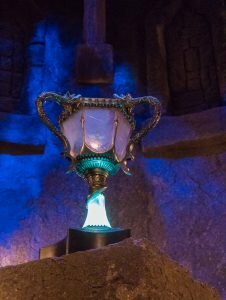 And, as our guide, Gabby, confided in us, it’s also the original Triwizard Cup from the films (which is slated to head back overseas once the ride closes up). After walking past the glowing cup we entered the basement dungeons at Hogwarts (I admit, if our guide hadn’t told us where we were, I wouldn’t have known for sure). The hallways were cool and dark. Blissfully air-conditioned. 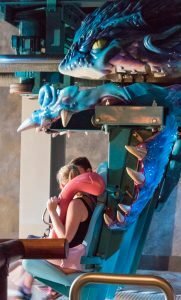 I was well aware that if you were lined up for a long wait, heading to your chosen dragon coaster, you’d be doing it in a cool, air-conditioned spot, well out of the Florida sunshine. There is a sound of dragons roaring. If you put your hand on these massive wooden doors you can feel vibrations from the giant beasts moving around on the other side. 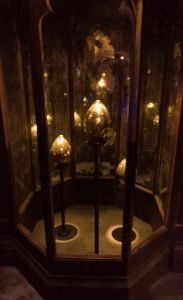 The queue led us past a glass display case which held three gleaming golden dragon’s eggs. 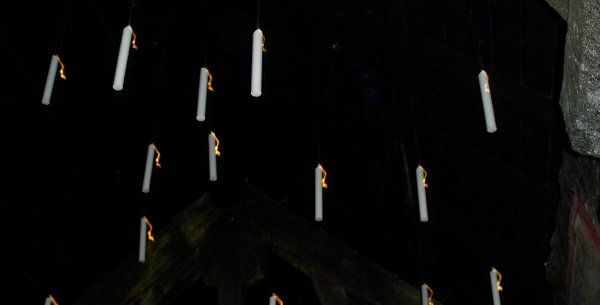 Further down the stonewalled dungeon hallways, we found ourselves in a room with a ceiling full of floating “enchanted” candles. The secrets that this room holds were one of the main reasons I had come with camera in hand and asked to walk through the queue. 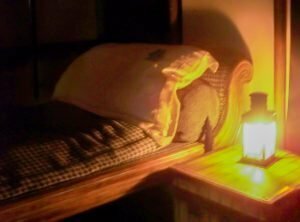 Along the walls in that candlelit corridor, there are tapestries, but the room is so dimly lit you can barely make them out. The day previous our VIP tour guide had warned me to keep an eye out for the “gorgeous woven tapestries” which were created specifically for this ride (Who knows what will happen to them once the ride comes down?) I wish I had brought a flashlight with me. The room was far too dark for my camera to get any decent photos. Past the candlelit corridor, we reached a branching hallway with wooden placards depicting the two dragons. Which would you choose? 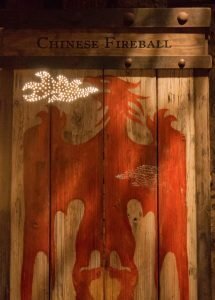 The Chinese Fireball or the Hungarian Horntail? My daughter picked the blue Hungarian Horntail. We went into the area where people normally line up to board the various cars of the roller coaster, and we walked up to the “head” of the beast, for a quick peek at the dragon up close. Note the dragon’s tongue, snugly holding the rider in place. And then we were ushered out a side exit, back out onto the streets of Hogsmeade. We were blessed to have an incredibly knowledgeable guide with us on our trip through the Dragon Challenge queue. I will admit, when I was told that we would need a chaperone to walk through the queue I was disappointed. It sounded like an awkward arrangement, at best. Instead, it was a delight to have a guide at our side, one who knew her Harry Potter trivia from A to Z. 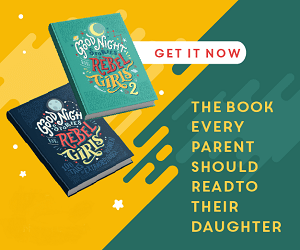 She spent the walk quizzing my daughter on various bits of the first three and a half books (we hadn’t quite finished up book four before leaving for our trip, and Gabby was careful not to let any spoilers slip about later plot points, such as Cedric Diggory’s fate). Our guide, Gabby, displayed a fierce pride. This was her ride, her baby, and she knew every inch of it, backwards and forwards. She knew the best spots to stop and take a photo. She knew little details, like the fact that the barred door with the dragons growling on the other side of it used to move “until we managed to calm them down a few years ago”. 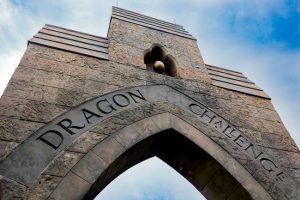 I am so glad that I got to experience the queue for Dragon Challenge before it closed for good. What about you folks? Have you ever passed this ride over during a visit to Hogsmeade? Or have you ever rode this coaster, or walked through its queue? Are you sad to see it go? Or simply excited to see what new Harry Potter themed ride will be popping up in its place? 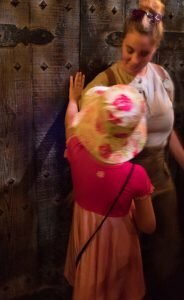 Disclosure: My family paid to take part in Family Forward 2017, a blogger conference at Universal Orlando Resort. We would like to thank Family Forward, Mom It Forward, Universal Orlando Resort, and Loews Hotels for the amazing experiences and special events that we got to partake in. As always my words and opinions are my own. As it was explained to me, the roller coaster is original to when the park opened in 1999 and is due for repair or replacement. It’s the same age as the Hulk coaster, which they just revamped and reopened last year. So, instead of repairing or updating it, they are tearing it down to make way for a new Harry Potter ride. One which Universal has been touting as “new and revolutionary”. While the queue had some very cool Harry Potter theming, the ride itself wasn’t particularly Potter-ific. They now have the chance to use that space to make a brand new, 100% World of Harry Potter ride. I’m dying of curiosity to see what they come up with. I wish this was in the cards for us. Sadly no big trips till next year. Looks like so much fun. Wow that looks like a great ride, and so many interesting Harry Potter artifacts. It is always sad to see rids go, but I have no doubt that it will be replaced by something very good.